Originally published in Automobile Magazine, here. It may look like the illegitimate love child of a corrugated shipping container and a dumpster, but the Volkswagen Thing was in fact the resurrection of a German military vehicle known as the Kbelwagen. 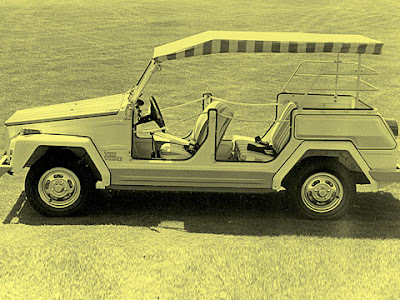 More than a specific model, the Kbelwagen was a concept; consider how Americans tend to call any military runabout a Jeep, and you've got the idea. And with Kbel meaning "bucket" and Wagen meaning "car," what could have been a better name for such a steel tub than, of course, the Thing? 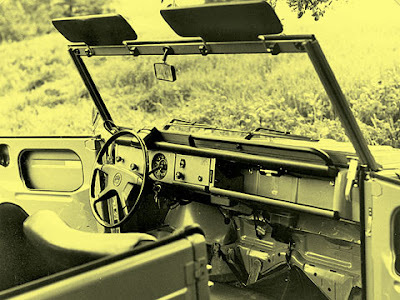 But VW's convertible breadbox was called the Thing only in North America, where it went on sale in 1973; it was known elsewhere as the Trekker, the Safari, or, simply, the Type 181 (right-hand-drive models were called the Type 182). The Thing was built on the same chassis as the pre-1968 Microbus and was propelled by VW's air-cooled, 46-hp, 1600-cc flat four. A four-speed manual was the only transmission. Acceleration was ludicrously slow: 0 to 60 mph took more than 23 seconds. The interior was the very definition of stripped. The only instrumentation was a speedometer that housed a fuel gauge on its dial, and the glove box was really just a glove hole, since it lacked a door. VW also boasted that the Thing's cabin could be hosed out. It wasn't conveniences or ability that sucked people in, though--it was how screwy the Thing was. The windshield folded and the detachable doors were swappable front to rear. Warmth was provided by an optional gasoline-fueled heater hooked directly to the fuel tank. Most important, however, was that the Thing looked so very, very weird. It wasn't the vehicle a housewife or a two-term Republican or anybody normal would buy. Naturally, America's youth loved the Thing--the only problem was that few of them could afford it. In 1973, the Thing cost $3150, almost as much as many sports cars and nearly $1000 more than the '73 Beetle. Prices dropped slightly for 1974, but the Thing remained expensive for such simple transportation. 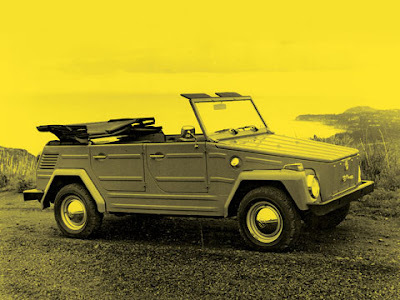 To downplay this fact, Volkswagen advertising talked up the Thing's modest off-road ability and pitted it against more expensive trucks such as the Toyota FJ40 Land Cruiser. 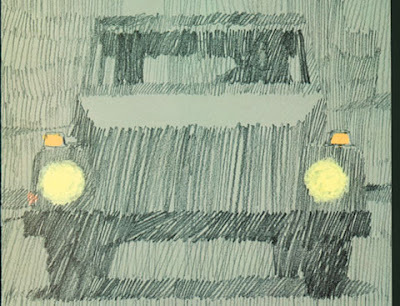 But the two-wheel-drive Thing, with its four-wheel independent suspension, had as much chance of keeping up with an FJ40 on the trails as a roller-derby queen with an inner-ear problem. In 1973, Ralph Nader pushed to have the Thing pulled from the U.S. market on the grounds that it failed to meet safety standards for passenger cars. He soon got his wish, as tightened regulations forced VW to stop importation after the 1974 model year. Only about 25,000 examples were imported, and the Thing remains as goofy and unusual today as it was thirty years ago. Since so many parts are shared with the Beetle and the Microbus, the Thing is inexpensive to run and maintain--but what else would you expect from a bucket car? WHAT TO PAYSolid drivers cost between $2500 and $5000, while perfect examples can run up to $14,000. Add five to ten percent for an Acapulco edition. PRODUCTIONAbout 140,000 were built between 1969 and 1980. Of those, approximately 25,000 were imported to the U.S. in 1973 and 1974. WATCH OUT FORRust (everywhere)and damaged tops. VW KBELWAGEN MILITARY PORTFOLIO 1940-1990by Konrad F. Schreier, Jr., Brooklands Books, $26. Give us a pumpkin orange 1974 model fitted with the optional roll bar, chrome wheels, and chrome shift lever. I LOVE your description of the Thing as an "illegitimate love child of a corrugated shipping container and a dumpster". I love the Type 181, but it's hard to imagine VW inviting that particular comparison without their tongue being firmly in their cheek. haha. get it? this Thing? I crack myself up.